« Sibling Love. That’s an oxymoron isn’t it? New life for an old photo. Since beginning this scrapbook journey that I’ve undertaken, I have learnt that some photographs are easier to scrap than others. Amongst our children’s photos I found these pics. They were taken by ‘Pixie’ photos. I don’t know if they are still around, if they are I hope that they are using better quality photographic paper than these were developed on!!!! All the colours are faded and there are a number of discoloured patches on the photo itself. However they are precious memories and I’m grateful to have them. This photo definately falls into the ‘difficult to scrap’ category for me. However now that this page is finished I’m very happy with the result. I’ve used the gorgeous Paisley Petals DSP teamed with Bravo Burgundy cardstock. I cannot believe that these kids have all grown up, this photo was taken in 1982. Onto something completely different! 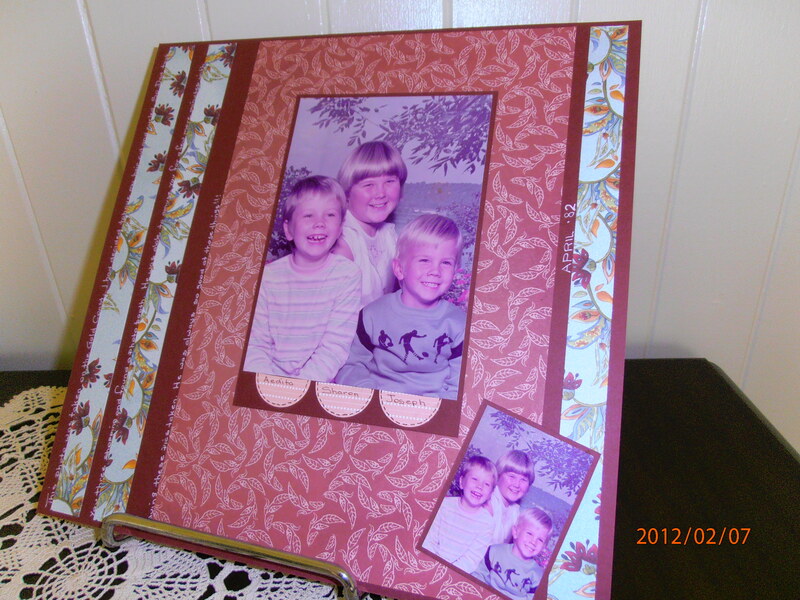 I have a scrapbook class to which three delightful girls attend. It turns out that these girls share February, with me, as our birthmonth. So each February we get together for a lunch and girly time. Inspite of the age difference we all get along famously and I just love these three as if they were my own daughters. As things happen we met up today for our ‘birthday’ lunches and it fell on Simone’s actual birthday. Knowing how Simone has such a sweet tooth for all things sugary and knowing that in her childhood she just loved Napolean cake, Angela managed to bring along such cake and we celebrated in style. Here is the lovely Simone ready to blow out her candle and get stuck into the cake. Thanks for the lunch girls, good food, great company. Can’t beat that! Have an amazing day Simone!